Napoli/New York/Hollywood is an absorbing investigation of the significant impact that Italian immigrant actors, musicians, and directors-and the southern Italian stage traditions they embodied-have had on the history of Hollywood cinema and American media, from 1895 to the present day. 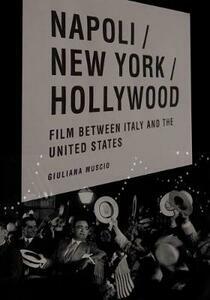 In a unique exploration of the transnational communication between American and Italian film industries, media or performing arts as practiced in Naples, New York, San Francisco, and Los Angeles, this groundbreaking book looks at the historical context and institutional film history from the illuminating perspective of the performers themselves-the workers who lend their bodies and their performance culture to screen representations. In doing so, the author brings to light the cultural work of families and generations of artists that have contributed not only to American film culture, but also to the cultural construction and evolution of "Italian-ness" over the past century. Napoli/New York/Hollywood offers a major contribution to our understanding of the role of southern Italian culture in American cinema, from the silent era to contemporary film. Using a provocative interdisciplinary approach, the author associates southern Italian culture with modernity and the immigrants' preservation of cultural traditions with innovations in the mode of production and in the use of media technologies (theatrical venues, music records, radio, ethnic films). Each chapter synthesizes a wealth of previously under-studied material and displays the author's exceptional ability to cover transnational cinematic issues within an historical context. For example, her analysis of the period from the end of World War I until the beginning of sound in film production in the end of the 1920s, delivers a meaningful revision of the relationship between Fascism and American cinema, and Italian emigration. Napoli/New York/Hollywood examines the careers of those Italian performers who were Italian not only because of their origins but because their theatrical culture was Italian, a culture that embraced high and low, tragedy and comedy, music, dance and even acrobatics, naturalism, and improvisation. Their previously unexplored story-that of the Italian diaspora's influence on American cinema-is here meticulously reconstructed through rich primary sources, deep archival research, extensive film analysis, and an enlightening series of interviews with heirs to these traditions, including Francis Coppola and his sister Talia Shire, John Turturro, Nancy Savoca, James Gandolfini, David Chase, Joe Dante, and Annabella Sciorra.